John has always wanted to work in a field that focuses on helping others. He looks for projects that can create societal change, normally focusing on new technology and experiential design. John believes that designers can drastically change the way people see and interact with the world by trying to constantly step into new perspectives. 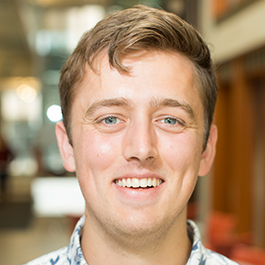 In his undergraduate classes, John studied human-centered design. He found that this field allowed him to tangibly change the lives of the people he designed for. Through the design process, John found he could let his creativity run wild to help him find innovative solutions to real needs. His strong sense of empathy led him to this field because of the powerful connection designers form with their users.